Building a powerful website appears to be quite daunting at times. It's very pleasant to hear that the solution to simplify the process of an Internet site creation has been found. 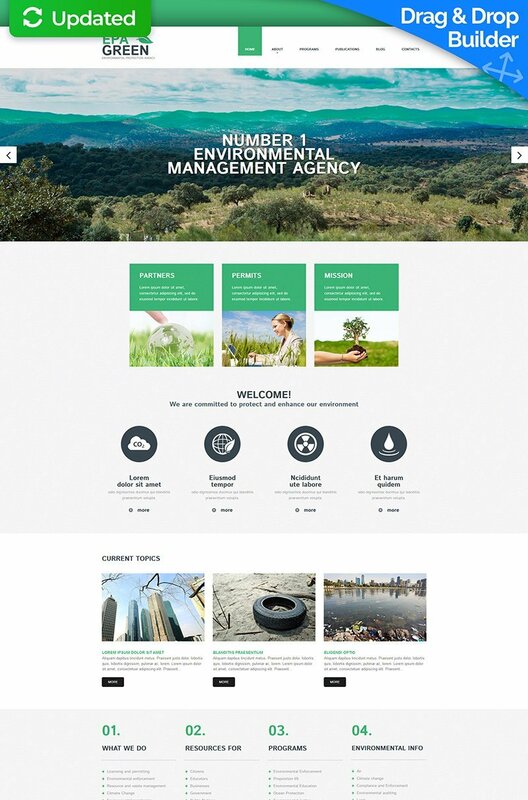 With an Environmental Responsive Moto CMS 3 Template you can build an effective and functional online resource to showcase any type of business, almost in no time. It has all the required features for that! - Ease of use. Creating a website has become such an easy and quick process that you can do it completely on your own. The CMS admin panel has a wide range of widgets and modules to customize your content in the most convenient way. Download a theme and set it up in just a few clicks. - Functionality. Our Environmental Responsive Moto CMS 3 Theme can help you create a lightning-fast site, complemented with a comprehensive navigation and easy-to-use interface. - Responsive design. Every single businessman knows, the right product presentation is a halfway to success. A fully responsive template ensures that your online project looks great on all devices & screen resolutions, including desktops, tablets and mobile gadgets. To help you understand how to use our product better, you can try our free 14-day trial offer. You are given unlimited possibilities to customize your content the way you want to. All of the demo changes are saved after the purchase, so you don't have to start editing all over again. Whether you have any difficulties, our professional support team is there to help you 24/7.